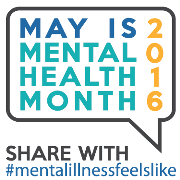 This May is Mental Health Month; Life Management Center is raising awareness of the importance of mental health. Join us on May 11 as we walk around the Peace Pond at our main campus to bring awareness to this important issue. Want to learn more about how mental health is an important part of your health? To schedule a presentation for your group, contact Tricia Pearce at tpearce@lmccares.org or 850.522.4485, x1107. You can also join us in supporting Mental Health America during May as they are asking individuals to share what life with a mental illness feels like by tagging social media posts with #mentalillnessfeelslike. Posting with the hashtag is a way to speak up, to share your point of view with people who may be struggling to explain what they are going through—and to help others figure out if they too are showing signs of a mental illness. Life Management Center wants everyone to know that mental illnesses are real, that recovery is always the goal, and that the best prospects for recovery come when we act early.